With workshop topics ranging from Arduino hacking to espresso brewing, new student organization Design, Art, and Technology Hackerspace (DAT Space) is making good on its promise to provide a student-run physical space where members of the UCI community can meet and work together on creative projects. 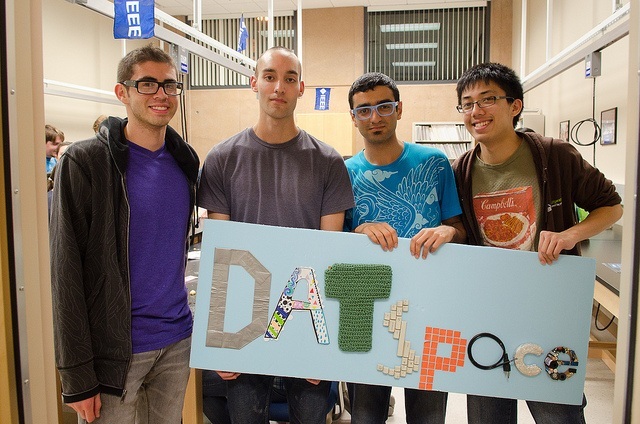 Sponsored by the Laboratory for Ubiquitous Computing and Interaction, DAT Space was founded in fall 2011 with funding from a Multidisciplinary Design Program grant through Calit2 and the Undergraduate Research Opportunities Program. The grant program is designed to help students develop skills and knowledge that will propel them into graduate studies or careers in fields that explore connections between different disciplines. DAT Space’s inaugural workshop, “Introduction to Arduino,” drew undergads, graduate students, researchers and faculty who learned how to program the popular microcontroller. Participants created a device that measured an input (e.g., light, sound or pressure) and did something in response (e.g., beep, light up, tweet). Next, “Introduction to Embroidery” had attendees stitching their own yarn designs. The third workshop, “Play Dough Circuits,” encouraged participants to learn the basics of electronics. Using batteries, a very small amount of wiring and two types of dough (one that conducts and another that insulates), student teams constructed light-up creations — some unique and others modeled after pop culture icons, like Pikachu and the deadmau5 logo. “The best part of the play dough circuits workshop? Finally getting my monster guy to light up,” said fourth-year biology major Dominique Lyakov. DAT Space wrapped up their fall quarter calendar with “Caffeine Night,” in which students shared their knowledge of making stovetop espresso, Persian black tea and malted cinnamon mochas. Check their website for future events and to view photos and videos of past workshops.